Lane Cottage is a charming cottage situated in the pretty hamlet of Didworthy 2 miles from the bustling village of South Brent where there are a good range of shops, local schooling/pre-school facilities, community centre, doctor’s surgery, DIY store, dentist and local bus route, along with good access to the A38. There is a mainline train station at Totnes which is some 20 mins drive away. The property is a fantastic example of its type and has been historically extended and currently offers well balanced accommodation comprising sitting room, dining room, kitchen/breakfast room, boot room, 4 bedrooms and family bathroom. Externally the property benefits from a generous garden with the recent addition of a summerhouse/studio, which is a lovely area to relax in with a book or even use as a study area, providing stunning views towards Dartmoor. Additionally, there is a meadow of approximately 2.4 acres with a useful large garage/workshop and further detached timber store room. To the outside of the workshop is a large hard standing which provide generous parking for numerous cars, boat, trailer or motorhome. 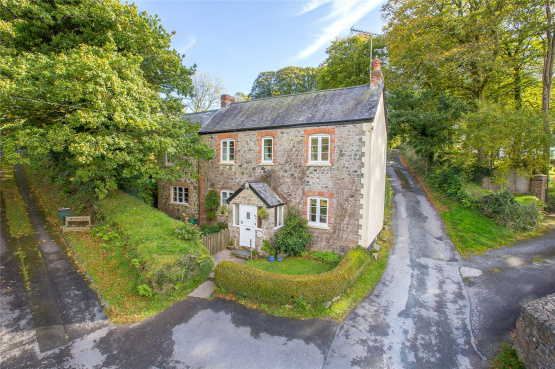 Lane Cottage is offered for sale with a guide price of £495,000. For further information please contact Marchand Petit’s Totnes office on 01803 847979.